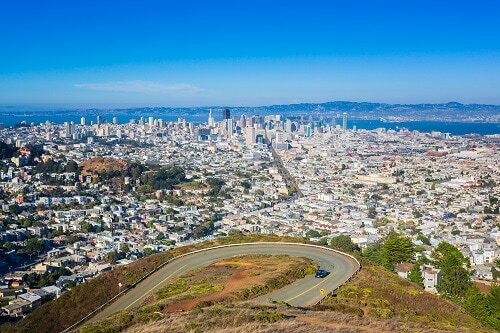 Iconic attractions, charming historic districts and incredible recreation parks greet visitors to San Francisco. When you depart on a cruise to Mexico, Alaska or Hawaii from here, take the opportunity to sample the city’s spectacular views, renowned dining scene and trendy shopping areas. This ‘Golden City’ truly does offer something for everyone. 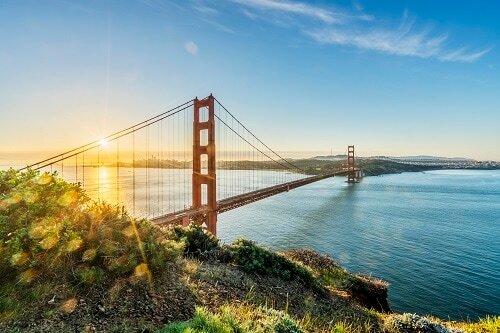 Here are our top tips for things to do in San Francisco. As one of the man-made wonders of the modern world, crossing the Golden Gate Bridge is a bucket list dream for many. Whether it’s shrouded in mist, glinting in the midday sun or glowing by night, the orange-hued structure never fails to impress. You can cross the strait of the Golden Gate via sidewalks on the bridge and, along the way, snap incredible selfies with panoramic views as your backdrop. 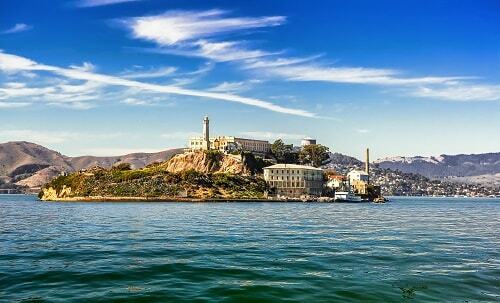 In terms of what to do in San Francisco, no trip is complete without a visit to Alcatraz Island. Once the site of the Pacific Coast’s first lighthouse, the island is famous for its time as a federal prison, housing notorious criminals. When you visit Alcatraz, you’ll get to tour the cell house to see where prisoners lived, with an audio guide full of historical insights. For a rich cultural experience, pop your walking shoes on and delve into the dumplings, tea shops and colorful alleyways of Chinatown. As one of the biggest Chinatowns in North America, you could spend days shopping for unique treasures, tasting exotic food and admiring architecture, such as the Dragon Gate at the official entrance. Picturesque Grant Avenue is the most popular place to go for souvenirs. 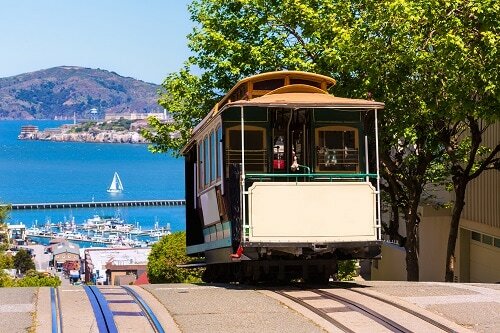 The best way to admire the views along San Francisco’s steep hills is to jump on the historic cable cars. The largest manually operated system in the world offers a romantic way to see the sights, with three lines to choose from. The Powell-Hyde line gets you to Ghirardelli Square and Lombard Street. Choose the Powell-Mason line for North Beach and Fisherman’s Wharf, or the California line to ride to the top of swanky Nob Hill. Overlooking the San Francisco waterfront, Coit Tower makes a dramatic impact on the city’s skyline. The elegant white tower rises from the top of Telegraph Hill, with an observation deck providing 360-degree views. Inside, you’ll find beautiful fresco murals in the lobby. You can catch an elevator to the observation deck to enjoy the views. However, if you’re feeling active, climb the Filbert Steps on the east slope of Telegraph Hill for city views along the way. How would you like to drive along one of America’s most crooked streets? 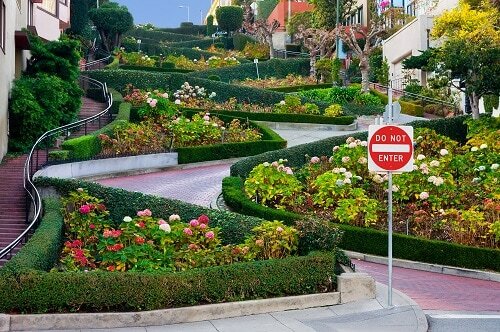 Lombard Street, featuring numerous hairpin turns in just a few blocks, is lined with spectacular mansions and colorful flower beds. After doing the pretty drive, walk around the area to take photos of famous homes, such as the reputedly haunted Montandon House, and unique views that encompass much of the city. Did you know that the first Irish coffee to be served in the United States was at a cafe in San Francisco? This local staple is a comforting blend of Irish whiskey, frothy whipped cream, sugar and, of course, coffee. You’ll find a wide array of versions in many bars, pubs, restaurants and cafes. 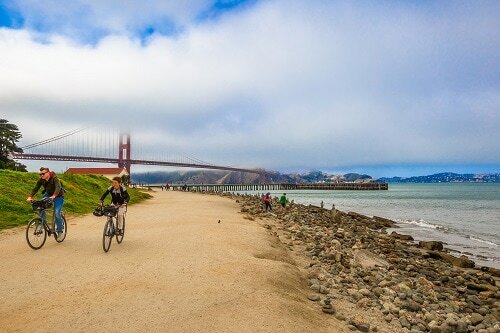 The Presidio is a national park and home to everything you could want for a family trip in San Francisco. With a fascinating military history, miles of hiking trails and incredible views of the Golden Gate Bridge, you may want to take a picnic and make a day of it. Check out the museum and cultural center at the Presidio Officers’ Club, birdwatch at Crissy Marsh and relax at Baker Beach. For memorable photos, head to the Palace of Fine Arts, with its Roman columns, swan-filled lagoon and exciting performance schedule. Located inside the Golden Gate Park is the stunning Japanese Tea Garden, the oldest public Japanese garden in America. When you visit in March and April, you’ll see blooming cherry blossom trees. Year-round though, treat your eyes to ornate pagodas, stepping stone paths, picturesque koi ponds, Zen gardens and native Japanese plants. In The Tea House, you’ll enjoy traditional Japanese tea blends and fortune cookies. For a day of recreation in nature, complete with awe-inspiring views, visit the world-famous Twin Peaks. Rising to 922 feet, the 64-acre park offers all-encompassing city, bay and ocean views. The area is surrounded by grassland and wildlife, including the endangered Mission Blue Butterfly. To spot all your favorite landmarks, there’s a telescope viewer at the summit parking lot. When you embark on cruises from San Francisco, you’ll discover a city rich in history, quirky culture, natural beauty and thrilling landmarks. From romantic cable car rides to crossing the famous Golden Gate Bridge, don’t miss your chance to explore San Francisco before or after your cruise. 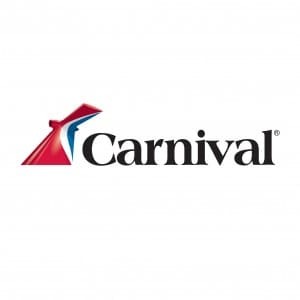 Pro Tip: In celebration of Carnival Miracle sailing from San Francisco in 2020, consider participating in our CHOOSE FUN Carnival Airship Sweepstakes for your chance to win a cruise for 2 among other fun prizes. Don’t miss out on this limited time offer!